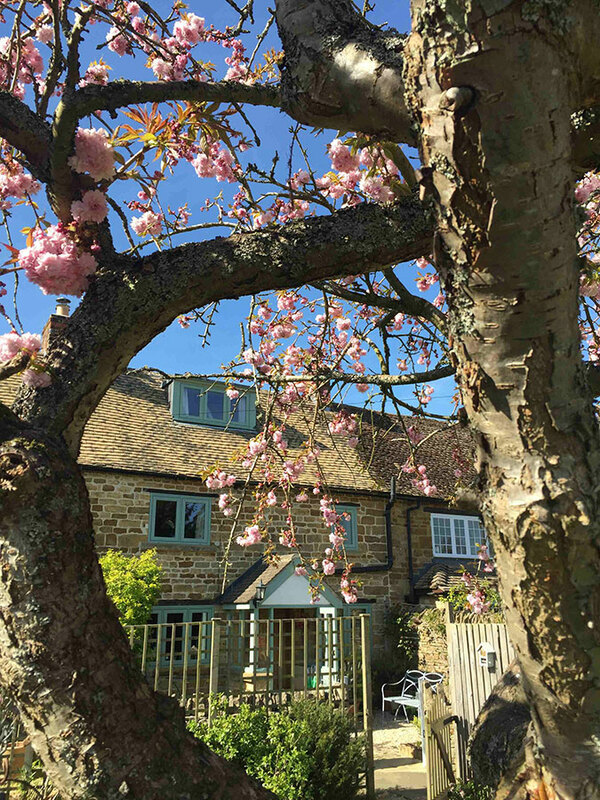 April arrived cheerily with gentle colour in gardens, fields, along river banks, roads and village lanes and appeared between the cracks of old Cotswold stone walls. 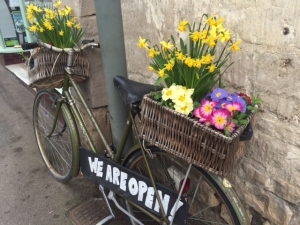 Oh yes, spring has begun and it’s a lovely month to pick and choose and stumble upon all kinds of things to see, do and tuck into. A splendid Simnel cake from Huffkins bakery half-way down the hill in medieval Burford set the tone at Easter with a glass of velvety raspberry liqueur from lovely Gibson’s Organic Liqueurs, close to home, and a circular walk which started at a gated footpath close to St Mary’s Church in Swinbrook village and through to Widford and across farm fields with views across the Windrush Valley. A date penned in the diary led to lunch and a tour around Denman College, a Georgian mansion house down a side lane in Marcham village in Oxfordshire and home to the WI with lots of courses on offer and well-kitted out cookery school. A blackboard propped outside the main entrance had chalked up names of butterflies, birds and spring flowers to spot in the grounds in April, along with their own honey bees in residence. Sudeley Castle and Gardens in Winchcombe and Upper and Lower Slaughter villages look suitably gorgeous in spring. A visit to the castle this month was timed to take in the friendly and busy event of a Spring Homes & Gardens Fair organised by Noelle Walsh with lots of talented exhibitors, and then out one weekend to an Art in the Cotswolds exhibition at the village hall in a perfect setting at Lower Slaughter. The afternoon ended in the sunshine by the clear waters of the river Eye with a cone of handmade organic ice cream from The Old Mill at the other end of the village. It really isn’t an option to head home without. Hurrah for April and all its charms, especially with the start of the asparagus season through the summer months until June! A trip out to The Organic Farm Shop near Cirencester was very necessary to pick up some bunches to lightly blanch, grill with a drizzle of oil, sea salt, finish with shavings of parmesan and a lightly poached, fresh farm CackleBean egg to pop on top. Simple and perfect for breakfast, brunch or any time of day. 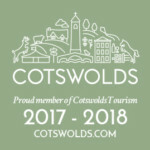 Do plan a visit soon!